Polyethylene construction for excellent chemical resistance, the 1647 features a spill capacity of 66 gallons and gratings with 1.75" square openings which remove easily for cleaning. Compatible with Eagle model E-1689 (Pic. 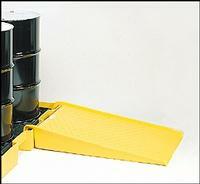 2) ramp for easy loading and unloading drums. 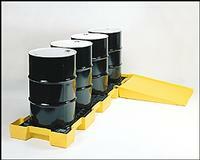 Meets EPA requirements for secondary spill containment of hazardous materials (40 CFR 264.175).